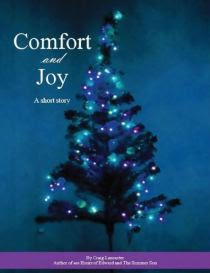 Life with Aspergers: Book Review: Craig Lancaster's "Comfort and Joy"
Just letting you know that Craig Lancaster, author of 600 Hours of Edward has released a short story for Christmas. The story is available in several formats including Kindle and several other formats including EPub and PDF. Unlike 600 Hours of Edward, this story isn't about Aspergers but it is a touching tale of loss and human nature and it makes a surprisingly good Christmas tale. The story is about 30 pages long and it's a great read. To say any more would spoil things. I'm looking forward to reading this. My husband won a copy of 600 Hours of Edward and really enjoyed it. Happy holidays!